Whole grains are an important part of my diet. From whole grain bread to whole grain cereal to whole grain pizza dough, I’m a whole grain fan all the way. Whole grains are far more flavorful than their “white bread” counterparts, in my opinion. My Wild Rice Salad with Dried Cranberries and Apricots is pretty and colorful and elegant enough for dinner guests. The cranberries and apricots offer bright red and orange bits in the earthy background of grains. 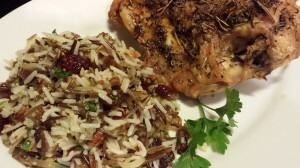 This wintery Wild Rice Salad goes great as a side dish with grilled or roasted meats, can be served as a main course, or spooned over lettuce leaves as a salad course. It can be served hot or cold or at room temperature. This salad travels well, so is a great option to take to a potluck dinner or include as a buffet dish. 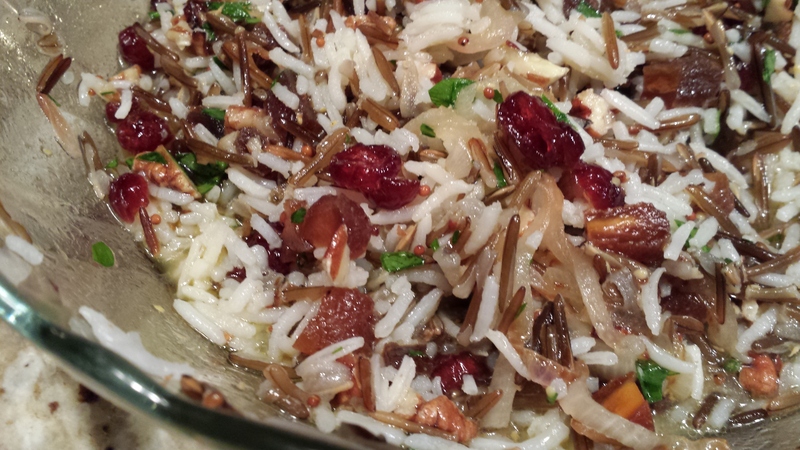 I served this wild rice salad for a New Year’s Day buffet dinner two years ago. 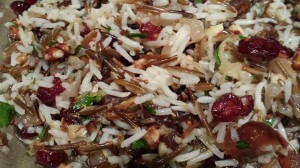 This cold wild rice salad brings together wild rice, brown (preferred) or white rice, dried apricots, dried cranberries, caramelized shallots, toasted pecans, and a citrusy grainy mustard vinaigrette. Let it sit a few hours or overnight for the best flavor. This salad tastes best when served cold or at room temperature. Cook the rices separately according to package directions with some vegetable broth to substitute for some of the water. Let the rices cool. (I was out of brown rice when I took the photos for this recipe.) You should definitely try adding half a cup of cooked barley to this dish along with the brown rice for a chewier texture. Chop some dried apricots and some toasted pecans. 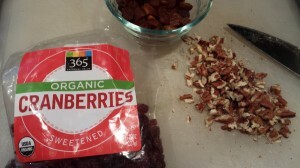 The dried cranberries should be fine when used whole. 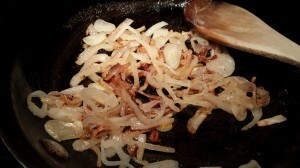 Caramelize some shallots and let them cool. Whisk together the citrusy vinaigrette. Mix everything together and let it sit for a few hours or overnight in the refrigerator. Can be served at room temperature or chilled. Serve alongside a baked chicken breast, as a side for your turkey dinner, or as a main course over greens. 1. 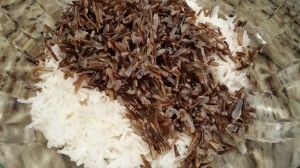 Cook the wild rice in vegetable broth and water according to package directions. 2. Cook the brown or white rice in water (add any leftover or additional vegetable broth) according to package directions. 3. Let rices cool to room temperature after cooking. 4. Saute shallots in butter until slightly caramelized. Let shallots cool to room temperature. 5. Combine cooled rices and shallots in a large glass or plastic bowl. Add toasted pecans, cranberries, and apricots. 6. 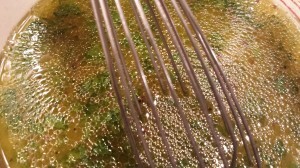 In a glass bowl, whisk together the orange juice, honey, garlic, mustard, and vinegar. 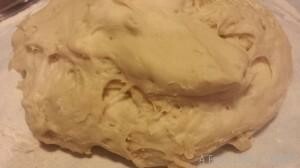 When smooth, whisk in the olive oil until mixture begins to emulsify. Use more or less olive oil in the dressing depending on your preference. 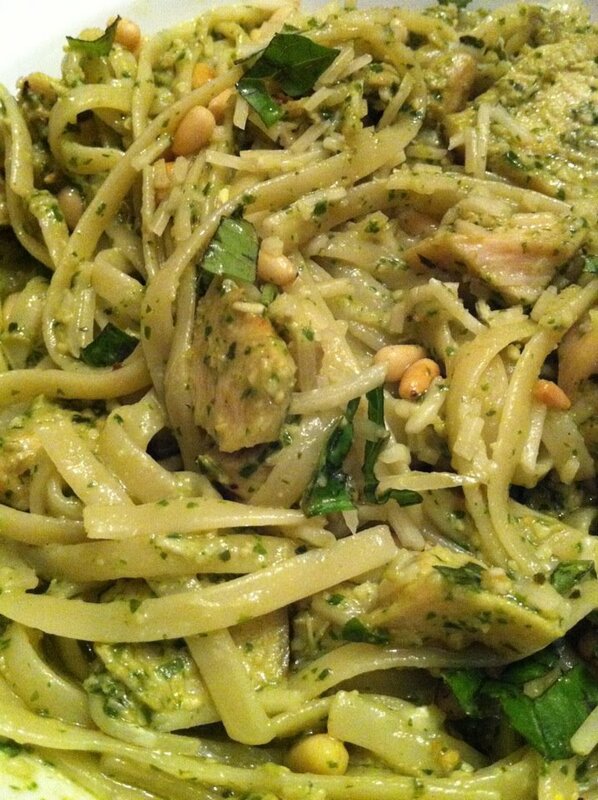 Add the parsley and whisk again. 7. Add the dressing to the rice mixture. Stir until rice mixture is well-coated with the dressing. 8. Let sit several hours in the refrigerator or overnight. If it looks like you have more dressing than needed, don’t worry, as the rice will absorb the additional liquid. Adjust seasonings to taste, and stir before serving. 9. Serve cold or at room temperature in a glass bowl to enhance the colorful salad. Tastes best cold. Serves 6 – 8 as a side dish with grilled poultry or ham steak. Variations: Omit the nuts. Use canola oil instead of the olive oil for a lighter flavor. 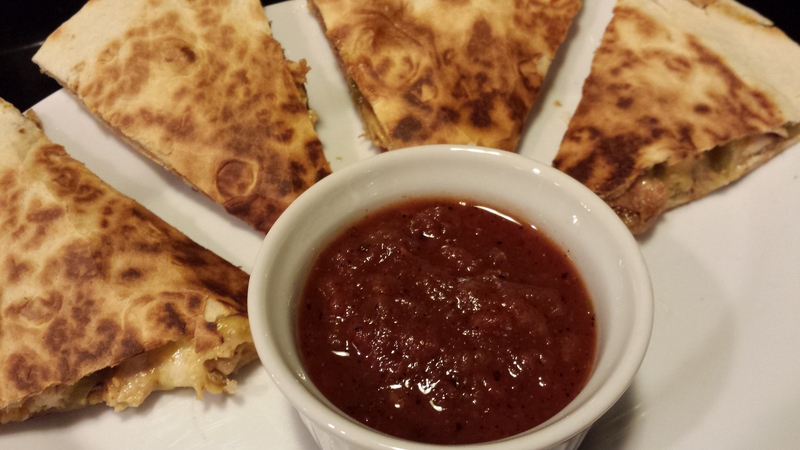 Substitute chopped dried apple for the cranberries and apricots. Add some cooked barley to the mix. Use chicken stock instead of vegetable stock. 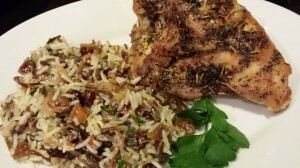 Add 2 cups of diced grilled chicken to serve as a main dish.